Create a WordPress Blog 2019 - 50% off Hosting + Free Domain Inside! In this post, we’ll create a WordPress blog from scratch without coding or complicated jargon. Then we’ll add some images, posts, pages, plugins, and even setup your very own advertisement from Google! But first, I wanted to share my first ever blogging story/failure/lesson with you. In my first ever post-college interview (for the Daily Beast) it was going really strong, then they asked me what my favorite blogs to follow were. I couldn’t name one. I was so caught up in real work experience and academics that I totally flopped. The interviewer got up and walked out briefly saying thanks. That’s the story+failure. Now obviously I could named 1000 blogs I love. The lesson? Read blogs. Armed with your own, that’ll take care of itself with all the networking. The bonus? All those writing assignments you did in high school and college have 1000% prepared you to write a blog. And it’s time to make it all worth it. 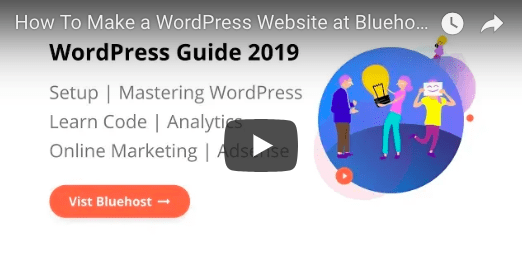 Disclosure: This guide contains a Bluehost deal to create a WordPress blog with a free domain name and 50% off web hosting. The discount is only applied on the first term and the free domain only applies to the first year. If a user clicks through our Bluehost links and signs up we will receive a commission. We review countless web hosts each year and feel Bluehost is the best bet for you to get setup quickly and inexpensively in this beginner WordPress tutorial.Learn more. 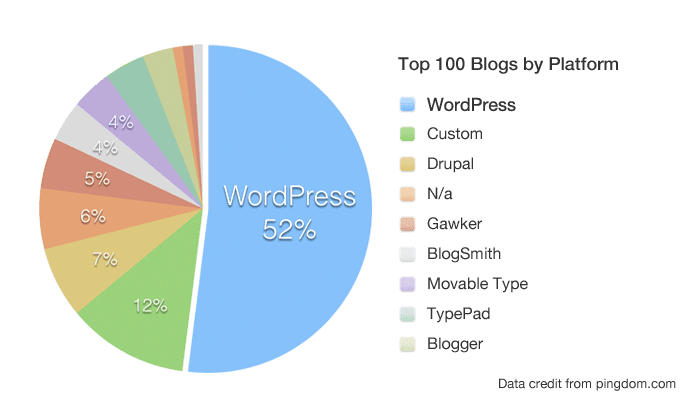 WordPress now leads 52% of the blogosphere, and over 30% of the most viewed websites. To create a WordPress blog today you just need two things. And, you need a little push. For me, the push to make a WordPress blog was needing to make rent in NYC 2010. Kinda a hard push, more of a shove actually. 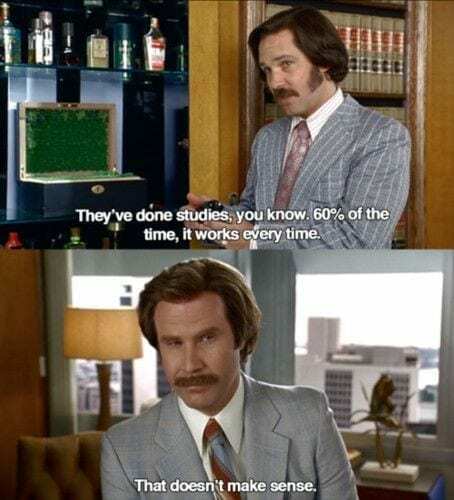 That sure makes you learn how to make $100 from Adsense fast. For you, the push might be same as mine, or wanting to have more freedom from work, or to share your expertise, or maybe get sponsored by companies for your writing because why not?! If you’re reading this page, I bet you’re pretty good! Freedom Greg! I wrote and published my first post nearly a decade ago because freedom overcame fear. Fun overcame fear, too. I felt blogging could be a fun, freeing way to express myself and to help people. The good new is, you can do it too, and because we help thousands of readers start a blog each month, you’re certainly not alone! Hear from bloggers who came before you! 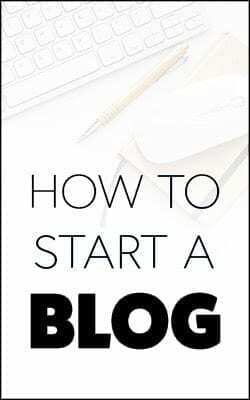 You just need to make a small commitment to actually create a blog, right here super easily like the pros do, then invest a little time to learn WordPress (no coding required) then you’re on your way. Fact: There is a 99% chance the domain name you always wanted to register will already be picked. It’s unfortunate, BUT this can be a blessing in disguise because most of us don’t think long term when we want to buy our first domain. What happens when you get old? Also way too long to remember. My best friend / musician / blogger bought timmytalent.com, then his PR agency decided that was too childish and made him change it. Kinda rough for him, he had to create a WordPress blog twice! Two word combos are GREAT! Think “You+Tube, Net+Flix, Car+Soup, I’m sure you can think of more” and all are multi-million dollar brands thanks in part to a sound domain name strategy. Your friends drag you out to a concert. Randomly at the after party you meet this famous blogger you’ve watched or read. What an opportunity! In the time is would take you to say that domain name you could lose that famous blogger’s attention forever. So keep it short and sweet! Once you settle on a perfect domain name, you should know that the annual cost of a domain name is roughly $15/yr. That’s roughly what you’ll pay at GoDaddy (though coupons exist, like when you buy for 2 yrs upfront). For most new bloggers, that $15 is actually a lot. Fortunately, the web host we have hand selected for this tutorial, Bluehost, will give a domain name absolutely scotch FREE for 1 year. This takes some of the pressure of starting a blog. 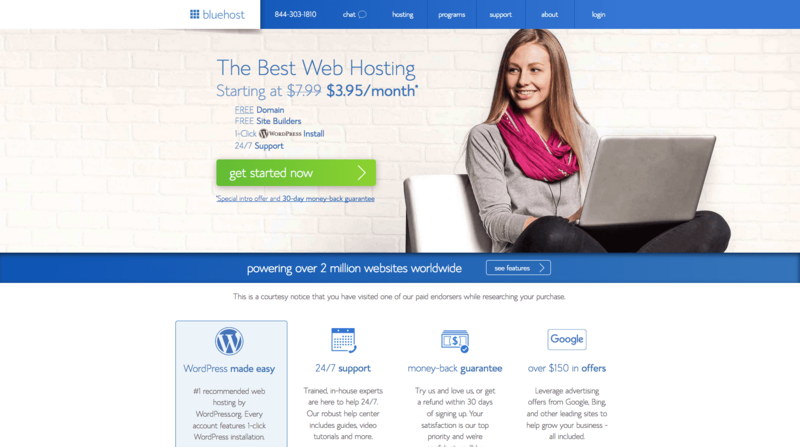 Bluehost is one of the web hosts I use myself, they make it easy to setup a WordPress blog, and are also the #1 recommended host by WordPress themselves. There are thousands of web hosts out there who want your business. Researching them can really throw a wrench in the whole create a WordPress blog thing. You could even host it yourself. But turning your computer into a web host is generally only meant for the Bill Gateses and Mark Zuckerbergs of the world. And when you shut off your computer the blog would go down. So most bloggers including probably nearly 100% of the popular blogs you and I read have chosen instead to get an affordable web host, like Bluehost, to take care of the techie stuff for them. What is the point of web hosting? Let’s address a common question right now: What even is web hosting? By definition it is virtual space… Web hosting is the space where your blog lives. Just like you need a plot of land to build a house, you need web hosting to build a website or blog. (and if web hosting is the land where you build, your domain name is like the address of your house). Web hosting gives you WordPress install tools, tons of features like backups and security, and also sets you apart from others who don’t have it. It puts you on a level playing field with Mashable, Forbes, Beyonce and so many other blogs powered by WordPress. Everyone who uses WordPress needs web hosting. Hosting packages come in all shapes and sizes. As mentioned above, a domain name typically costs $15/yr. Web hosting can run you up to $10/month. For most new bloggers, that’s a lot. 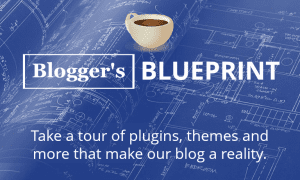 Fortunately, along with the free domain name, Bluehost has agreed to give DearBlogger readers an exclusive 50% off discount, so the hosting costs basically nothing (and the domain is free). Based in Provo, Utah, Bluehost has been in the hosting industry over 10 years, has servers in UK, Brazil, Singapore, India and more, and is known for tailored WordPress packages. Their friendly support staff is always turned on too, you can contact them 24/7/365. They come with a 45 day money back guarantee as well. That said Bluehost isn’t the only great, affordable web host! We also recommend HostGator (just as good as Bluehost for USA + International), SiteGround (for UK users) and HostPapa (for Canadian users). Always do your homework, click thru, read a bit about each site. Good news is WordPress will look the same when you’re blogging and creating no matter where you host it (but speed and price largely depend on your host). At the end of the day, you really can’t go wrong with Bluehost. Alternative option. What about a 100% free option? You don’t get your own unique domain name. Instead, you get a .wordpress.com domain name which is bad for branding as per our example above, bad for SEO and hard to communicate with others. 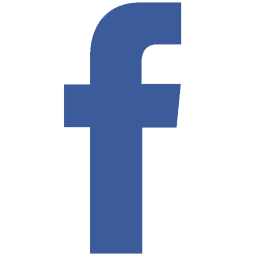 You can’t earn income through advertising. Aka you can’t post Adsense ads for free from Google. You also can’t add plugins, edit the code and do other basic tasks you’ll surely want to do eventually. Putting all your work on a free blog host means giving up a ton of control and limiting what you can do. This can lead to some big regret, and may require you to migrate WordPress.com to WordPress.org or Blogger to WordPress later on. For these 2 simple reasons above, I and so many other bloggers recommend you create a WordPress.org blog from the get go. These days it’s really cheap, easy, and you get all the tools to become a success like the other blogs we all probably read. 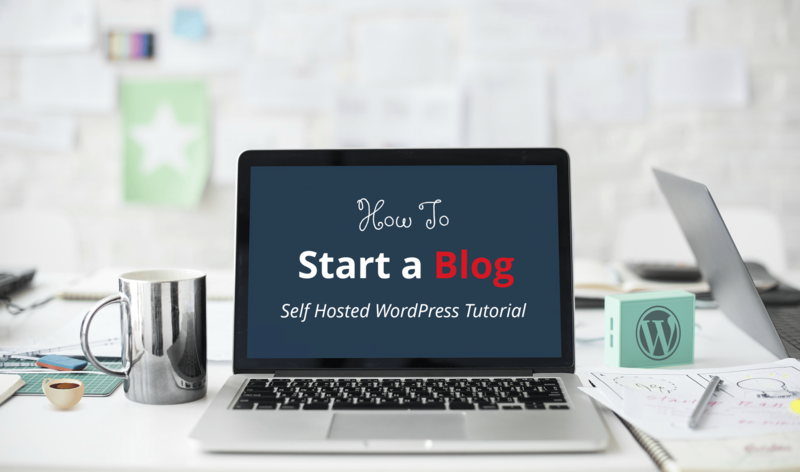 And, Bluehost makes it all about as difficult as setting up Gmail..
That all said, let’s see how to create a WordPress blog from start to finish. Step 3: Time to Finally Create a Blog! So, you have your perfect domain name in mind (we’ll register it in one second, or if you already did, that’s fine too as there’s a step for that included here). You understand web hosting (and if you don’t, that’s fine, we didn’t really get it until we made our first blog so it’s okay if you’re still in the dark). You know now that Bluehost offers new users a free domain and $3.95/mo web hosting. So the last thing we need to do is just make the blog already … let’s do it! Settle in for about 30 minutes and we can do this. This video explains how to get a free domain and the best possible discount off hosting at Bluehost, then install WordPress with ease and login to your new blog. Note: If you don’t like the video or can’t wait, the full written steps are below. 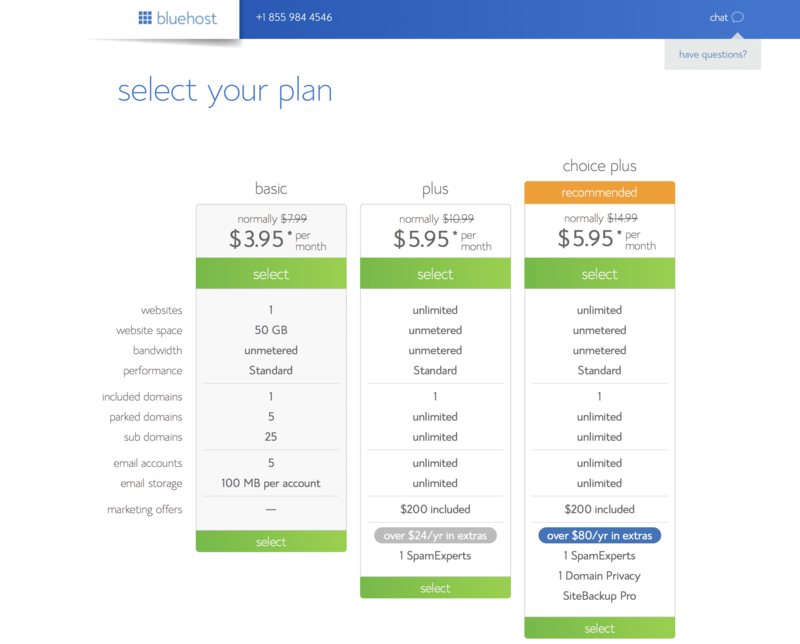 The first step is to visit www.Bluehost.com and click the green Get Started Now button. You could also click “WordPress” in the menu, but this takes you to a more expensive, deluxe WordPress package. We want the cheapest option. The basic and plus plans are the best value, so go with one of those two. The main difference is plus lets you run multiple websites while basic is just one. 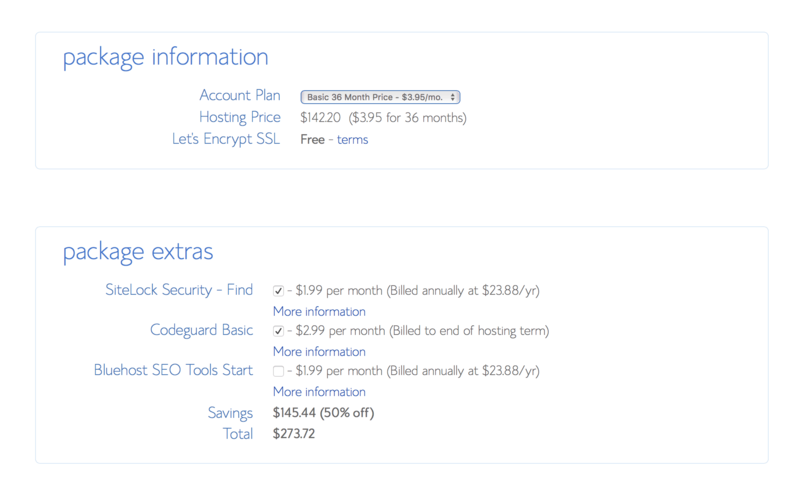 They both now come with a free SSL too, which rocks. I just like the “basic” plan the most because it’s the most affordable and you can always ask them to upgrade you later on. Enter in a new domain name on the left (which you get for free) or pop in a domain you already bought on the right. Only fill in one of these boxes. If you have a domain name from GoDaddy, Namecheap or elsewhere already, we will connect it to your hosting after you get Bluehost hosting, so please proceed if that’s your scenario. 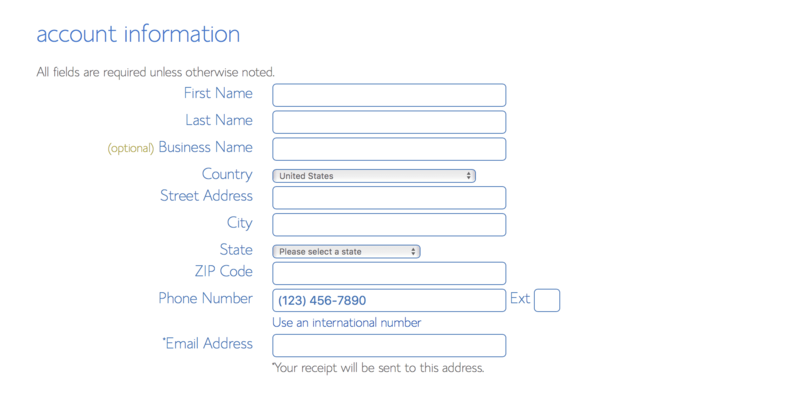 Just click next and you’ll be taken to the account information screen. Pop in your info, then scroll down to package information and select how long you’d like hosting for. When I first got hosting I signed up for 12 months, so this Account Plan feels good. The price should be about $4.95-5.95 for 12 months, which is dirt cheap for this type of thing. However as you can probably see the 36mo price is the best deal available. Basically for 12 months you are getting 26% off, however for 36 months you are getting 50% off! Once you’ve chosen your discounted plan, go ahead and feel free to uncheck the package extras. Bluehost can add them for you later on if you’d like. 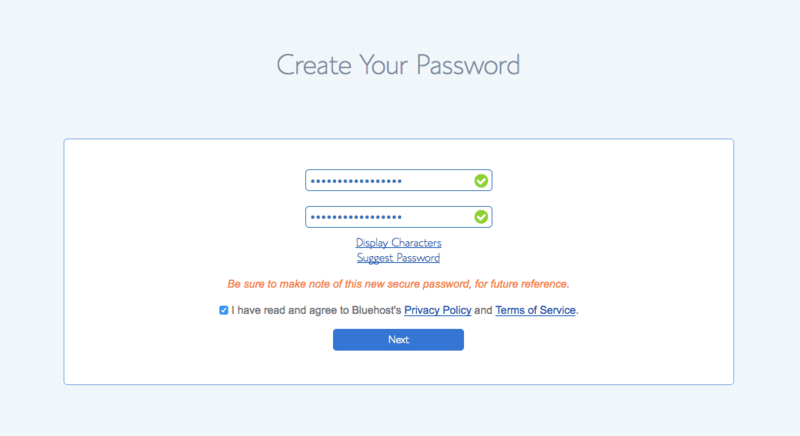 Bluehost will then setup your account for you. All the hard stuff is done! I’ll still walk you thru all the screens you’ll see on your way to getting your own copy of WordPress because I know it can still be a little nerve racking your first time. On the next page, you’ll see a Welcome to Bluehost message. Congratulations! Go ahead and enter a secure password a couple times (don’t need a screen for that) then click Next. Okay now click log in. 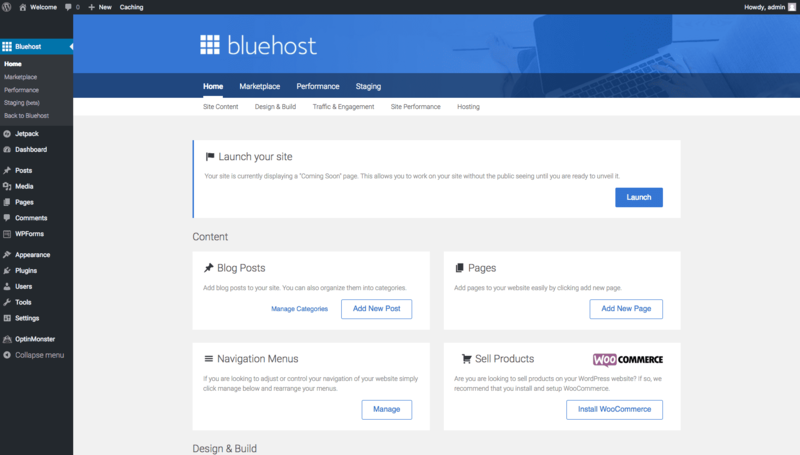 This will take you inside the Bluehost dashboard, to the pick a theme screen. 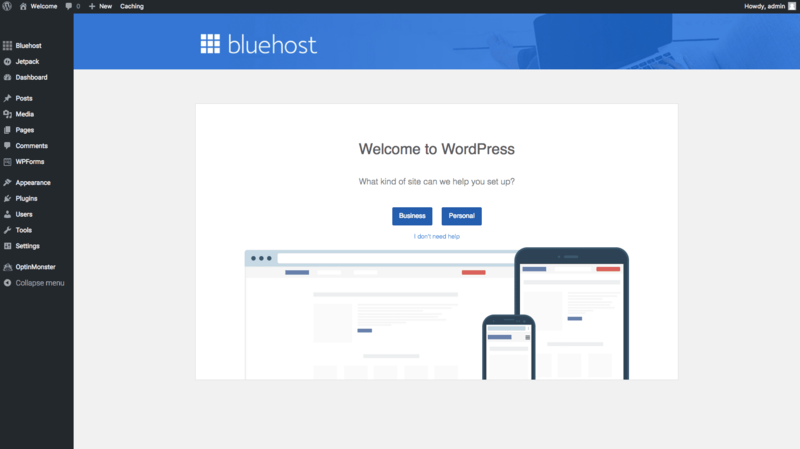 For our Bluehost 2019 Tutorial which you’ll find below, we used OceanWP theme. 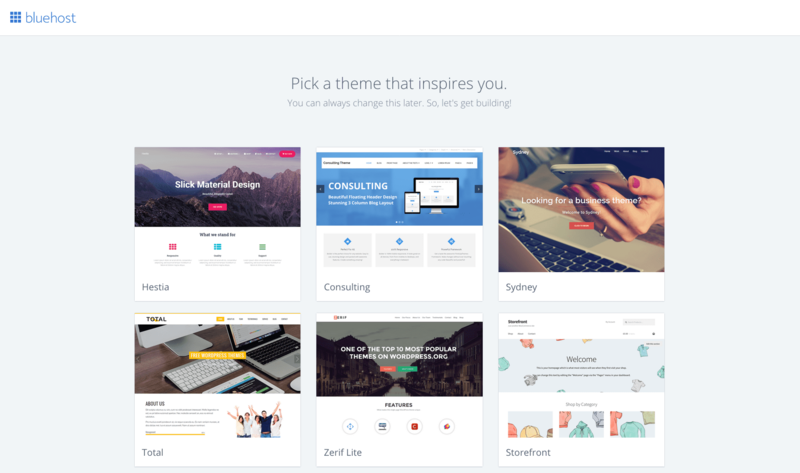 It’s a very basic theme and works perfectly with Elementor page builder. However, some themes will guide you through how to setup a blog a little more. My personal favorites you won’t find on this screen at Simple Catch and Laurel. Check these out. The best move now, given you should probably research themes a bit more so you’re actually happy with it long term, is to just click Skip This Step at the bottom. 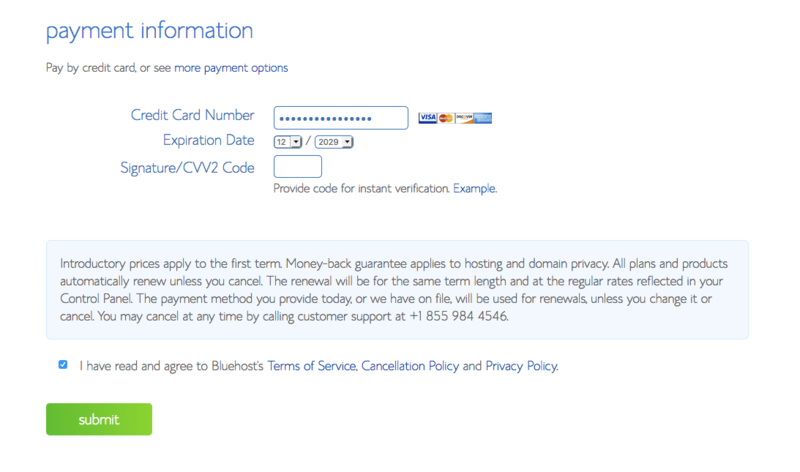 Bluehost will think for a moment, then show you this check mark screen. Click Start Building. You’ll be taken to your WordPress dashboard for the first time! You’ve arrived, Welcome to WordPress! Click on “I don’t need any help” as we don’t want WordPress to setup everything for you and guess what you want. I’ll show you how to create three different, equally amazing types of blogs + websites below in just a moment. Once you click “I don’t need any help” you can then click Launch to get rid of your coming soon page. I personally like getting rid of the coming soon page so my friends can view the blog from anywhere and give me their best friend test opinions. But if you’re nervous about your boss seeing it before it’s done or something, you can keep that page up and don’t have to click Launch. Your blog is now all yours! You have your own copy of WordPress.org just like Jay-Z, Tech Crunch, Mashable, Pinch of Yum, Star Wars Blog and more. Go ahead can create a WordPress blog however you want! Well if you want to run free, go ahead. However, we have about a bagillion video tutorials that help new bloggers and website owners each day, with a huge community you can engage at any time as you create a WordPress blog so you’re never really alone. I’ve selected 3 videos I think will help you get started with learning how to use WordPress. 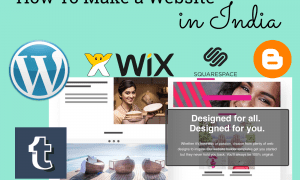 Learn how to create a WordPress blog with huge HD images, sliders, instagram overlay widget, videos, logo and other features ideal to make a blog about cooking, photography, travel, fitness, yoga, finance, and more. Create a Business Website, Classic Older Video, Still Rocks! Use Sydney, the best one page WordPress theme with smooth anchor scrolling buttons, social icons, counters, portfolio, blog and more features to setup a business or agency website to stand the test of time. 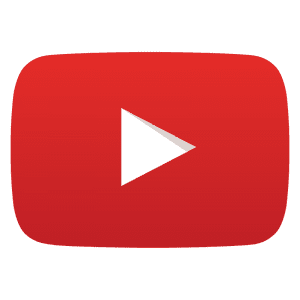 You can get all these guides and so many more on little WordPress fixes you might need if you subscribe to our YouTube channel. The first step is to create a WordPress blog, as Google will check to see if you have a real website before accepting you. You must also be 18 years of age, and in some cases have to verify additional information like location and bank info. Conclusion: Let me know how it goes! WordPress rarely works 100% of the time. When you build a WordPress blog maybe 60% of the time it works. But it’s often not WordPress’s fault. We just need to use good ol trial and error to figure out our own way for the best way to do something. Then, once you master WordPress, you have gained a skill that will open doors and some nice moola in terms of blogging and even web design. The sky’s the limit. 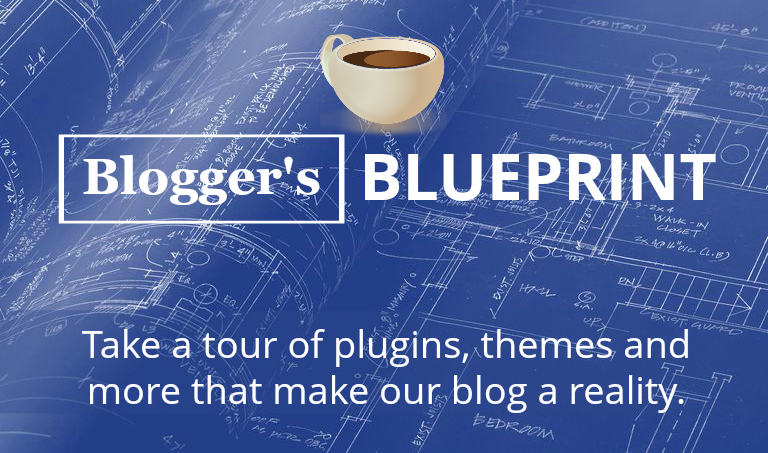 We’re here to help you create a WordPress blog and do anything else you might want to do! Join the DearBlogger community for two free eBooks with answers to common FAQ. Also, get used to engaging others by just posting a simple comment here with a little love (or hate). Taking little steps to get going is what it’s all about! Talk to you soon! 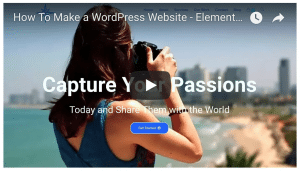 7 Responses to "How to Create a WordPress Blog – 2019 – Join Our Easy Beginner’s Guide"
this is very good website yes i also think new bloggers must have passion & dedication of what they are doing. choosing the right path is very important for every blogger. This checklist of creating a blog has helped me a lot in implementing a good blog of mine. Thanks for sharing this blog post and helping me through. I appreciate you ! It is very useful for us, Thanx for sharing with us. We are waiting for your next post. Great Work. Hi, Very good useful post. I think new bloggers must have passion & dedication of what they are doing. choosing the right path is very important for every blogger. Most of the new bloggers starts thinking they will do well in future, But only few succeeds, like you.